The woes of residents of Lutyens' Delhi bungalows are not to be “monkeyed” with. 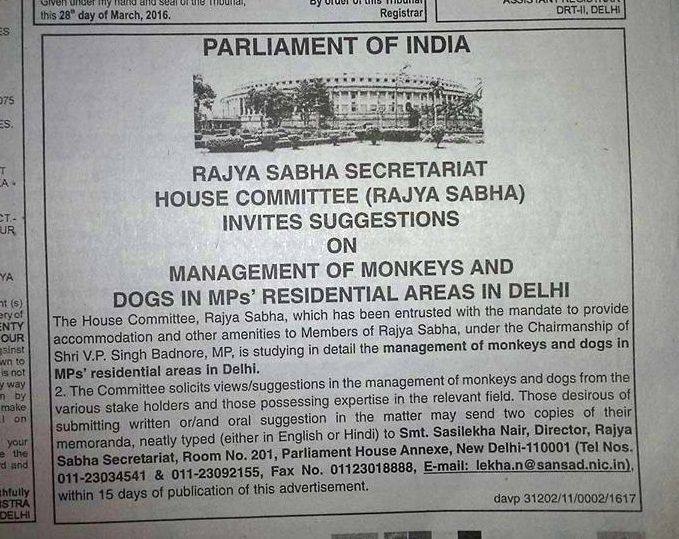 In an advertisement released in newspapers, the Rajya Sabha Secretariat’s House Committee has “invited suggestions on management of monkeys and dogs in MPs’ residential areas in Delhi”. While this might be a way of life for those residing in the other not-so-influential pockets of the capital and country, the MPs and their bunglows seem harassed enough to get ready for action. “We have been receiving a lot of complaints on the havoc created by the monkeys and dogs. Complaints pouring in have become a daily feature,” V P Singh Badnore, BJP MP and chairman of the Rajya Sabha House Committee, told Down To Earth in a telephone conversation. “However, we will not kill them nor will we encourage anybody to kill them. It is not a ‘menace’. It is only an issue that requires management,” he was quick to add. Singh said he was looking forward to activists, wildlife managers and institutes like Wildlife Institute of India (WII) to come forward with reports on tackling the issue. The irony here is that rural india and farmers have been screaming themselves hoarse about the monkey menace for years now. In a cover story last year, Down To Earth had highlighted how the farmers of Himachal Pradesh, Uttarakhand and Karnataka were harassed by the monkey menace. Data shows that in August 2015, crop damages due to monkey attacks amounted to nearly Rs 1,400 crore. In the village of Nangla Mandaud in Muzaffarnagar district in Uttar Pradesh, monkeys have laid siege to the entry road to the village and “descend in dozens to attack people carrying food items. Local residents estimate there are four to five groups, each consisting of at least 15-20 monkeys, which have made life difficult for farmers and others”. City dwellers are not far behind when it comes to such suffering. Primate Research Centre, Jodhpur, had told Down To Earth that more than 1,000 cases of monkey bites are reported every day in Indian cities and cited the example of former deputy mayor of Delhi, S S Bajwa, who fell from his terrace and died in 2007 after monkeys attacked him. However, it is better late than never. The lawmakers, enforcers and VVIPs residing in the Lutyens' Delhi finally seem to have noticed the plight of those residing in Delhi-6 and have opened their eyes to the issue. One hopes that this is the harbinger of solutions which the country has been waiting for.